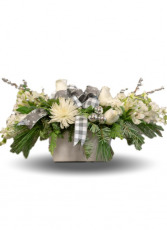 Blue and White fresh flowers mixed with evergreens fill our rustic box in "Miracles Light". Box ix approximately 4"X 7". Upgraded prices include more flowers and are designed to keep the same look and feel of the arrangement. 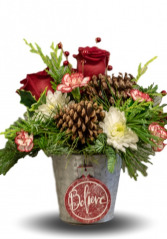 The "Believe" arrangement contains a keepsake ornament and is designed with fragrant Christmas Greenery, Roses, Cushion Daisies and Mini Carnations. Container is 5" tall. Upgraded prices include more flowers and are designed to keep the same look and feel of the arrangement. White Roses, Fuji Mums, Stock and Alstroemeria accented by fragrant evergreens in our Snowmance arrangement. 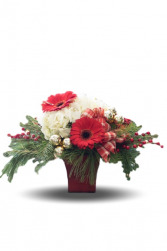 Designed for a centerpiece, perfect for a hostess gift or a centerpiece for your home. 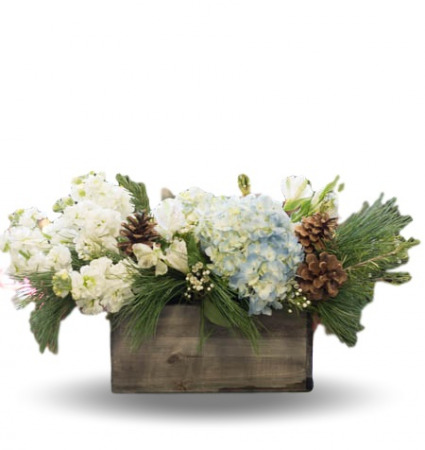 Container is approximately 4"H X 7"W. Upgraded prices include more flowers and are designed to keep the same look and feel of the arrangement.